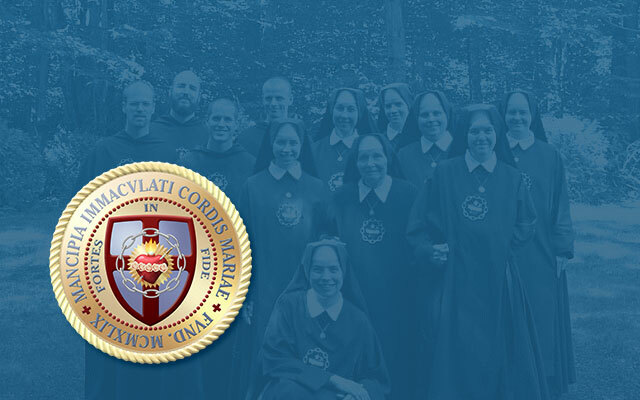 The Slaves of the Immaculate Heart of Mary are a Congregation of religious brothers and sisters dedicated to a two-fold Crusade: the propagation and defense of Catholic dogma — especially extra ecclesiam nulla salus — and the conversion of America to the one, true Church. Besides the religious members, the Congregation has a Third Order comprised of mostly lay people living in the world. The religious members live in the priory and convent at Saint Benedict Center in Richmond, New Hampshire. Our Crusade was begun by Father Leonard Feeney, who strove to combat the liberalizing of Catholic dogma which he saw as a major impediment to the conversion of America. The choice of the word “Crusade” to describe our mission is no accident. “The life of man upon earth is a warfare” declared Holy Job (Job 7:1). St. Paul admonishes us to arm ourselves with spiritual weapons to fight the enemies of our souls (Eph. 6:11-17). While every Catholic is called upon to fight the world, the flesh, and the devil, our battle also engages them specifically in the forces of the Revolution 1 ,many of which have entered the very precincts of the Church. Our methods are threefold: personal sanctification, education, and works of the apostolate. For Religious members, personal sanctification comes by way of our prayer life, our Marian Total Consecration, and living the vows and virtues of the religious life. Our Third Order members also live the Marian Total Consecration, and are joined to the congregation by simple promises. Our educational work takes place in several ways. One is the Saint Augustine Institute, a program of continuing Catholic education which has the goal of forming apostles to work for the conversion of America. Another is the running of primary and secondary schools (such as Immaculate Heart of Mary School in Richmond, New Hampshire). We believe very strongly that one must be a reservoir before he can be an aqueduct. For this reason, we promote continuing study of the Faith as one way to spread it. As religious, the works of our apostolate include the publishing of books, pamphlets, and our quarterly journal, From the Housetops. We reach out to the “man on the street” with our publications by distributing them door-to-door in an effort to spread the faith. Another very important aspect of our apostolate is the work of fostering Catholic community life. At Saint Benedict Center in Richmond, our religious brothers and sisters work with Third Order members and other faithful to build and maintain a thriving Catholic culture. The community provides both an atmosphere conducive to wholesome family life and a hub of missionary activity to convert this nation. We are dedicated not only to the Deposit of Faith in its integrity and to sound Catholic morals, but also to the western liturgical patrimony of the Church as we have it in the traditional Roman Rite Mass (the “Extraordinary Form”) and the other sacramental rites associated with it. Have You Seen the New Immaculate Heart of Mary School Website?